Silk flowers are a good alternative to real flowers because they do not die and last indefinitely. Silk flowers are widely available in hobby stores, but making your own silk flowers is a fun craft that results in orchids the exact color and size you desire. Creating silk flowers takes some practice, but when the craft is mastered you can quickly make several flowers at a time by cutting several layers of silk out at once. Trace the orchid stencil outline onto the silk using a fabric pen. Cut out the flower petals using sharp scissors. 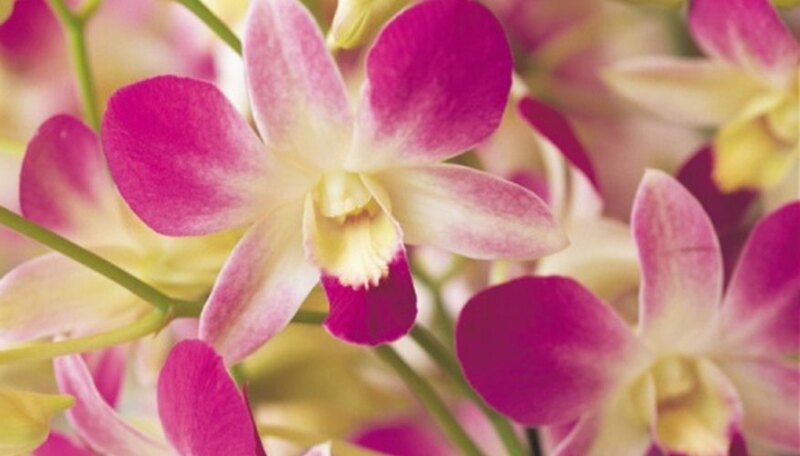 Assemble the orchid in your hands, starting with the lower petals and adding the upper petals on top. Arrange them so they look like a real orchid. Look at a picture of an orchid or a real orchid as a guideline. Cut a length of thin floral wire with wire cutters and feed it into the center of the orchid. Secure it in place with floral glue so that the fabric is adhered to the wire. Wrap green floral tape around the floral wire to give the appearance of a stem. Add glue to the top and bottom of the tape to keep it in place.